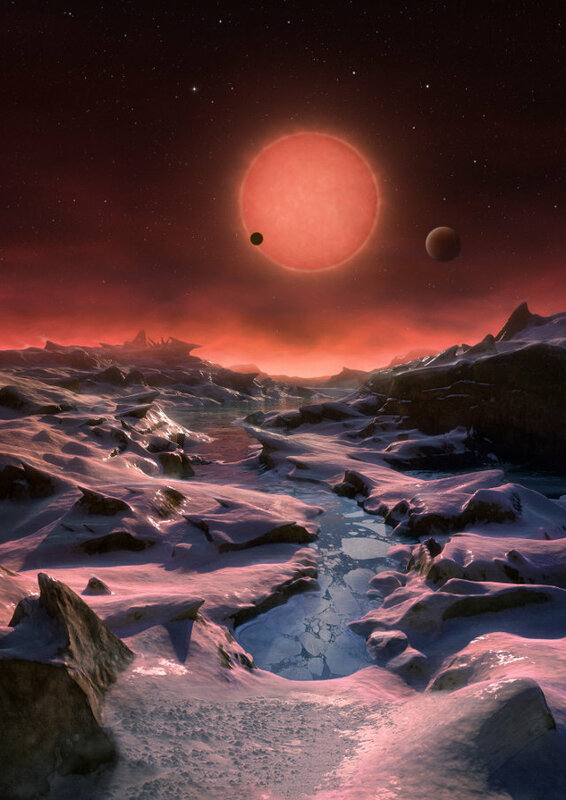 An article published in the journal “Nature” describes the discovery of a solar system with three rocky planets that orbit the star TRAPPIST-1, a really small ultra-cool dwarf. A team led by Michaël Gillon of the Institut d’Astrophysique et Géophysique at the University of Liège in Belgium, found these planets with sizes and surface temperatures similar to those of the Earth using the TRAPPIST telescope at ESO’s La Silla Observatory in Chile. The star TRAPPIST-1, earlier known only as 2MASS J23062928-0502285, is about 40 light years from Earth but is so small that emits a light too dim to be seen with the naked eye. Ultra-cool dwarfs are common but it’s the first time planets orbiting one of them are found. The TRAPPIST (TRAnsiting Planets and PlanetesImals Small Telescope) telescope is a prototype for a more ambitious project called SPECULOOS (Search for Planets EClipsing ULtra-cOOl Stars, which aims precisely at finding planets that orbit very small and thus relatively cold stars. The discovery of the three planets of the TRAPPIST-1 star is a great achievement but it’s only been the beginning of this research. Follow-up observations were conducted with the HAWK-I (High Acuity Wide-field K-band Imager) instrument of ESO Paranal Observatory’s VLT (Very Large Telescope) telescope. It’s used among other things to investigate exoplanets and in the case of the TRAPPIST-1 system allowed to obtain more information in particular on two of the three planets. The planets orbiting the star TRAPPIST-1 have sizes very similar to the Earth’s. For now it’s been possible to determine the years of two of them, which are really short because they’re respectively 1.5 and 2.4 days. The third planet’s year is still very vague due to limited data so it was estimated between 4.5 and 73 days. It’s even possible that actually there are two planets mistaken for one due to non-continuous observations. Indeed four very similar planets in the same solar system would be an astonishing discovery! These planets are much closer to their star than Mercury is to the Sun. It’s really a miniature solar system that Michaël Gillon compared to the Jupiter system and its moons for its small size. In fact, the estimated size of the TRAPPIST-1 star is slightly greater than that of Jupiter even if its mass is much higher: the density of the gas that composes it is what has made it possible to trigger nuclear fusion in this very small star. The discovery of these three planets prompted great enthusiasm because of their size very similar to the Earth’s. It’s theoretically possible that the habitability potential in the TRAPPIST-1 system is also better than that of our solar system because Mars is much smaller than the Earth and Venus. However, there are many reasons to be very cautious. First of all, the presence of atmosphere in the TRAPPIST-1 planets must be verified and and studied. The two inner planets may be too close to their star to have conditions suitable for life of our type and may be similar to Venus instead of the Earth. They always show the same face to their star and that’s not ideal at all. The outermost planet could be a bit too far to have liquid water on its surface even if it had an atmosphere similar to the Earth’s. In short, it’s far too early to say that Earth’s twins have been found. The discovery of rocky planets in the TRAPPIST-1 system is still very interesting because it confirms that even tiny stars can have potentially habitable planets. It’s for this reason that this system has been defined ideal for future research with the next generation of telescopes to fully understand if those planets are really habitable.